Interview conducted by a 3rd party with an Operator who recently replaced a competitor’s equipment with JJ Tech equipment. Q. Tell me a little of the history of the field and how you came about using a competitors equipment. A. We acquired this field back in April 2016 from a different operator and the competitor’s equipment was already in place. We were doing recompletions of old shut-in wells to try to re-establish production. As we would bring another well online, we would use the competitor’s equipment because we had no infrastructure and they already had equipment in the field. Q. How did you find JJ Tech? A. This was the first time we had dealt with a jet pump, we’d always dealt with rods and insert pumps, so after searching the internet we came to JJ Tech’s website. After reaching out to JJ Tech I was put into contact with their Project Manager, Jon Mullins. Q. What is your overall impression of jet pumps after JJ Tech, and do you intend to use their equipment moving forward? A. Definitely, as a matter of fact I have already recommended JJ Tech to the company that I was consulting with before I came here. 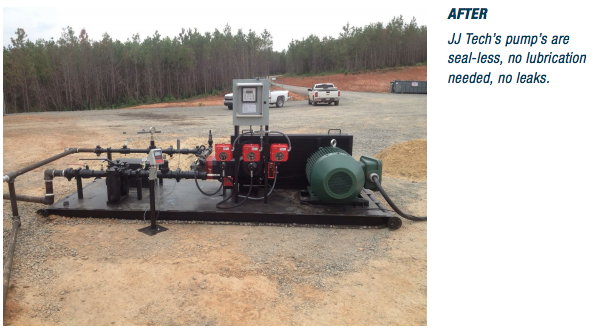 The jet pump would be a great application because of their directional drilling program. After drilling the wells they are having continuous rod part issues, rod part after another due to dog legs in the wellbore. The question was asked before, were there other ways to lift fluid? I didn’t have any idea about jet pumps at the time. I have now called my Production Foreman that I worked with previously and told him that I recommended JJ Tech and if they wanted to try the system, it would be worth a shot. I have already put their name out to several other people. Q. What were your issues and what kind of downtime were you having with the competitor’s equipment? A. One pump skid was brought straight to our location directly from another operator without taking it to their shop to properly go through the pump, redress, test, etc. They were unable to get the pump in operation for 1 month. The well was down for a total of a month and a half. Being that the well produces 20 barrels of oil per day the amount of production lost during that time was substantial to us. On top of that, we had to get a workover rig to pull the well because they couldn’t get the jet pump assembly out of the hole due to scale buildup while the well was sitting dormant due to the surface pump problems. This is when we had JJ Tech come out and do the first swap out of the competitor’s equipment over to JJ Tech equipment. I hate to say this and talk bad about anybody because I understand that things happen, but then again, with this particular pump when they were trying to get it running, once they did get it prepared as far as the internals of the pump, they went to turn it on and it would not come on, it was going down on overcurrent. They then determined the motor was bad. They sent the motor off, brought it back, and it was still down. They then asked me if I knew an electrician. As the operator, I had to call instrument techs to come out and fix their problem. Come to find out, the motor on the skid was a 200 hp motor, and the panel was only rated for 150 hp, I want to say. So it was very, very, unprofessional on their end. This particular well is when we decided to make the transition to JJ Tech. We then swapped all of the pumps out with JJ Tech’s equipment. Q. What was the time frame to get all three replaced? A. We swapped out the 3 units to JJ Tech from mid November 2016 to January 2017. Q. What was service like from start to finish? A. Simple, JJ Tech service was phenomenal. You can tell Jon is very knowledgeable about the equipment. When we call him we get a timely response. JJ Tech’s yard is about 3.5 hours from us, but when we would call we could have a technician on location within 6-8 hours. Compared to their competitor, we could be down from 2 weeks to a month. There is no comparison whatsoever. Q. Have you increased production? What was your utilization before and after? A. The total production is about the same but you have better runtime and less maintenance with the JJ Tech pumps. With JJ Tech pumps you basically turn on the switch and they run. Zero maintenance whatsoever. You also save money by not having to deal with lubricants and packing, as you would on a normal triplex pump. We needed to make this move several months ago. Q. Have you had any other downtime besides the one instance? A. None whatsoever other than the one issue and that was a quick fix. Q. Do you have anything else to share about your experience? A. It is really quite simple, your competitor is understaffed. They only have 2 mechanics that were able to run an operation. You call for assistance and it would take them a week to just come and diagnose the issue. Alternatively, JJ Tech is there within 8 hours ready to address the issue. Everything that the competitor had recommended, Jon told us the opposite. When it comes down to it, Jon told us what was going to happen and he has proved it. Not one thing that Jon said has been untrue. As far as fluid available, the competitor was telling my engineers that we could move 400 barrels per day with a certain pump and a certain horsepower. When I turned the pumps on we may make half that. I told them you have to keep in mind that the pumps may very well be able to move that amount of fluid, but if you don’t have that amount of fluid available in the wellbore you aren’t going to move that much. They hounded me hard. They wanted to know, where is my production, something isn’t right, you are missing something. I would tell them, No I’m not. I’m telling you, we are only moving 200 barrels from the well, while they are thinking in the back of their minds what the competitor was telling them. Finally, Jon met with me and the owner of my company. I explained the situation, that the competitor said they could move 400 barrels per day with their surface equipment and downhole equipment, and their combination, but they were only moving half. They made combination changes and so on. The competitor painted a picture and when it didn’t go right, they liked to point fingers. In the end, it was an overall bad experience. Jon [however] didn’t make any promises that weren’t kept. Q. Is there anything positive that the competitor did that JJ Tech can learn from? A. No they aren’t missing anything. I told Jon I was at the point with the competitor that I hated the jet assembly, I hated the jet pump system, it was a headache and my confidence in the entire system was blown. Jon said that he wanted to show me that the jet pump system can be quite simple, you just need the right equipment and the right people.